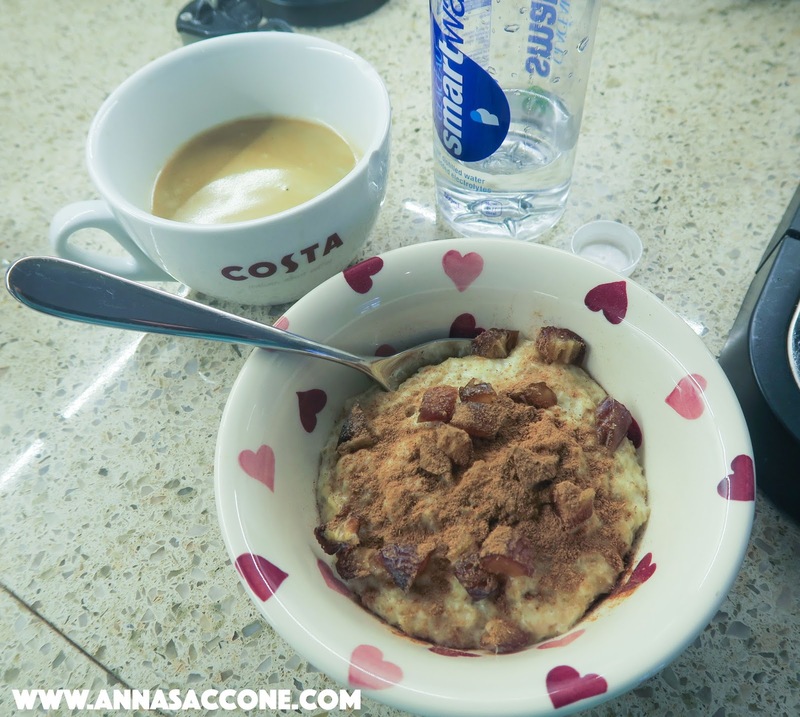 Breakfast was porridge with whole milk, a medjool date chopped up, cinnamon and a black coffee with a 1/2 litre bottle of water. After that I worked out with Lucy (9am) and we did a 20 minute HIIT workout which I included in my video. It's basically the same routine three times over! 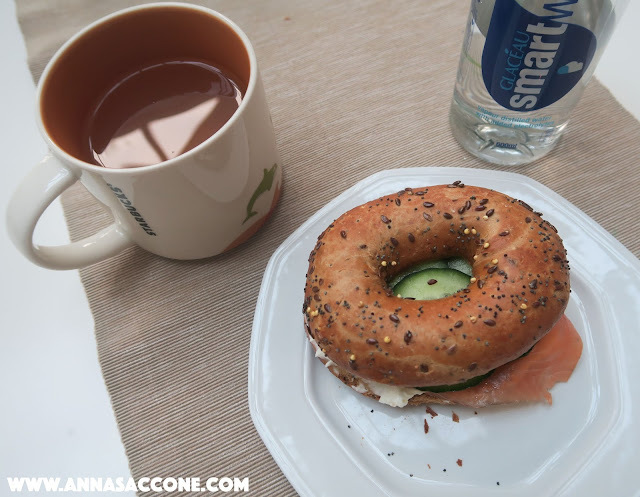 Lunch was a toasted wholegrain multiseed bagel slathered in Philadelphia cream cheese with smoked salmon, cucumber and a homemade ginger tea for my throat. I also had another bottle of water which I started during my workout. 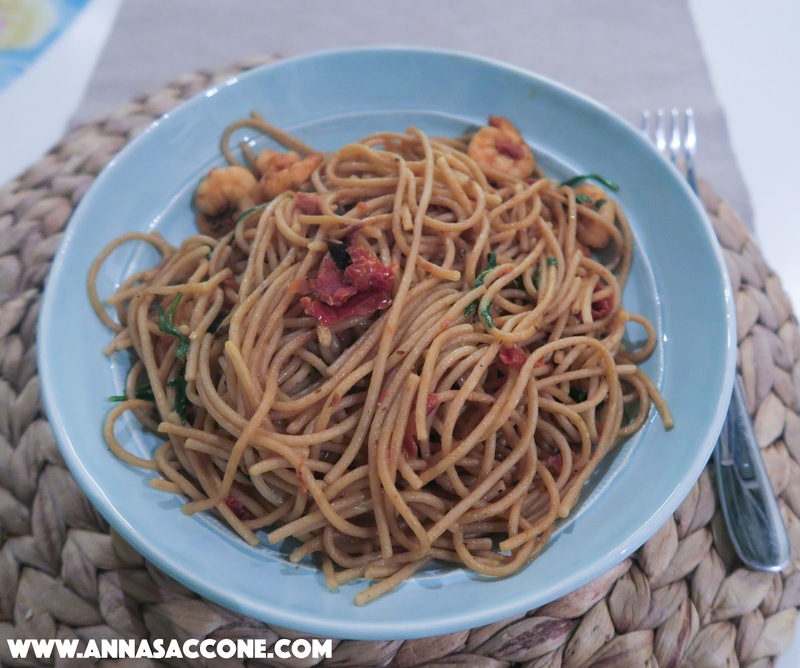 I made wholewheat spaghetti with prawns, chilli, rocket & sun-dried tomatoes (recipe from Jamie's Italy book). This was yummy and super easy to make. Plus pasta is always a hit with the kids so it gets a thumbs up from me! I also drank another 1/2 litre of water with my dinner. For pudding I was craving one of these cookies from our cookie jar...these babies are from the Waitrose bakery and are chewy, soft and taste homemade. I got three different types but this one is my favourite: white chocolate and cranberry. I had mine with a cup of warm skim milk which I heated up in our frothing machine. Later that evening I had another 1/2 litre of water along with a peppermint & licorice tea and that was it for today! You can watch my What I Ate video including this week's workout below. I love your What I Ate Wednesday's! They are definitely one of my favourite videos to watch, I look forward to them each week. I was actually thinking on maybe uploading mine at some point too! 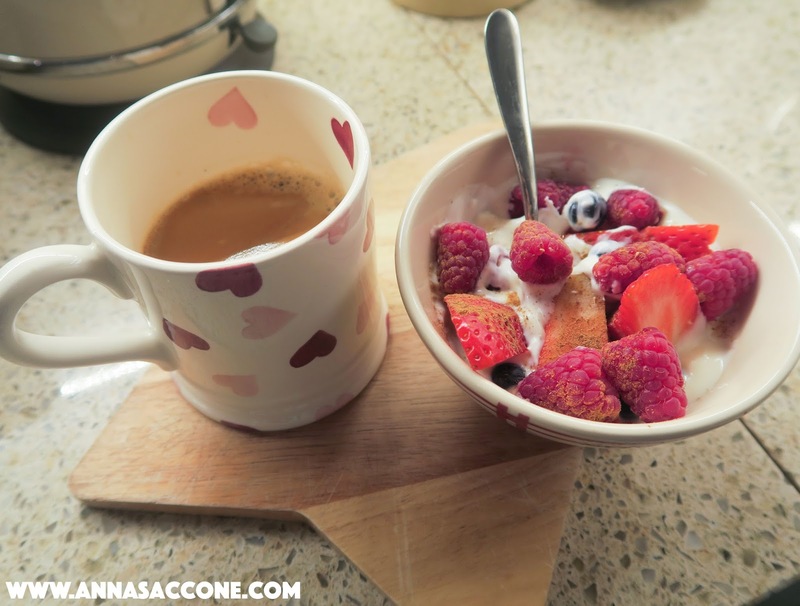 Thanks to you I'm LOVING porridge (or as us good ol' Americans call it - oatmeal!) I tried it a while ago, but it was plain oatmeal with maybe a little brown sugar and I just couldn't get over the bland taste and lumpy texture. But after watching your vlogs all the time I thought I should try spicing it up with some raisins, apples, and/or cinnamon, and now I love it! Hi Anna. Love the blog! Just wondering if you know where in Ireland (cork!) that you can get medjool dates? I've tried many supermarkets but can't find them anywhere! Dying to try them! Thank you for sharing your workouts!! Get well soon!!! Watching in Nova Scotia, Canada! Love the song played during your workout. Could you tell me the name ? Love reading and watching your video's Anna. I hope you are feeling better and your eyes are recovering. The fruit you had as your snack looks soo good by the way :). I love "What I ate Wednesdays." They're so helpful and inspiring. Feel better! 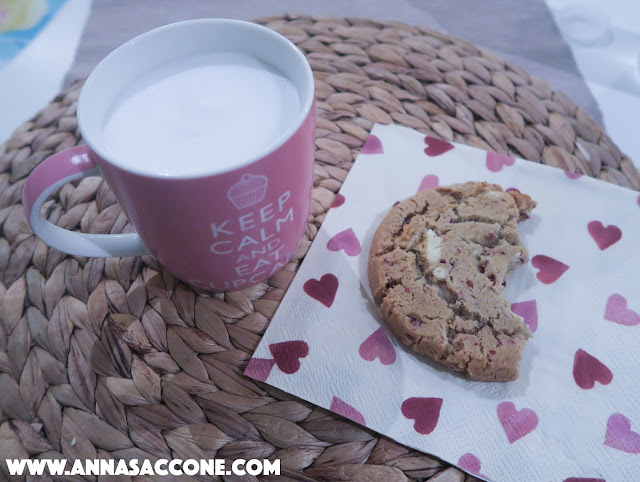 Thank you so much for your "What I ate Wednesdays"! They're so helpful! It's a good example of what a day should look like if you're trying to eat healthy and maintain your weight. It's very inspiring! I appreciate them! Please keep them up! In fact, I plan to take pictures of my own 'day' of food soon just to see what I'm actually eating in a visual. And I have to say that I've only recently discovered you and your family and love you! I love your personal channel and all your beauty/fitness/baking/parenting advice and watching your sweet little family. Both your babies are beautiful! Anna despite the fact that you had a nasty allergic reaction to deal with, you are still gorgeous! I started watching your vlogs when you were pregnant with Emilia (I was pregnant with my first and was clueless) and I'm addicted! I wish we could be friends in real life! Hahah. I guess that's what it feels like to have a favorite celebrity to follow but to never meet them. :) I feel like a nerd! Anyway thanks for letting us be a part of your life. I imagine it's not easy. Hopefully you and your family are feeling better now! can you give me the recipe for the pasta? It looks delicious! Whenever I read your what I ate Wednesday posts, I read them in your accent! Its so lovely Anna! I'm a complete cinnamon lover too!